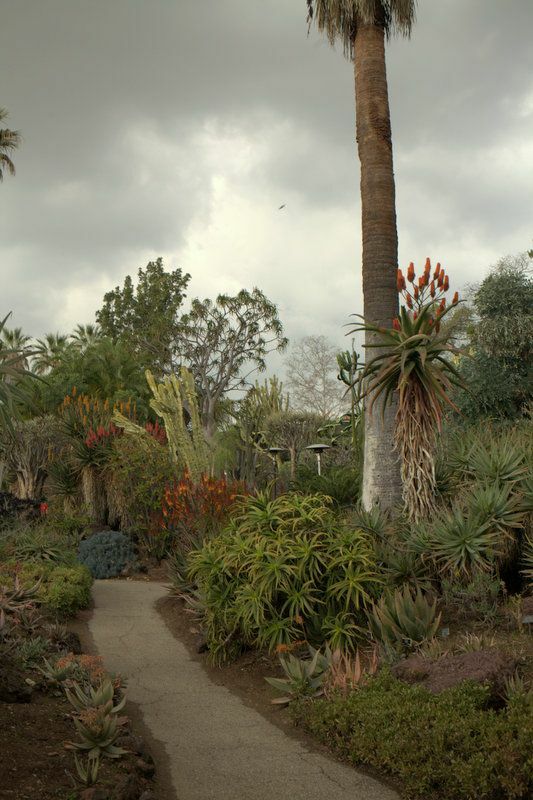 I got caught in a rainstorm at the Huntington’s desert garden yesterday, which was magical. I should be getting out to the Huntington every week in winter/spring. 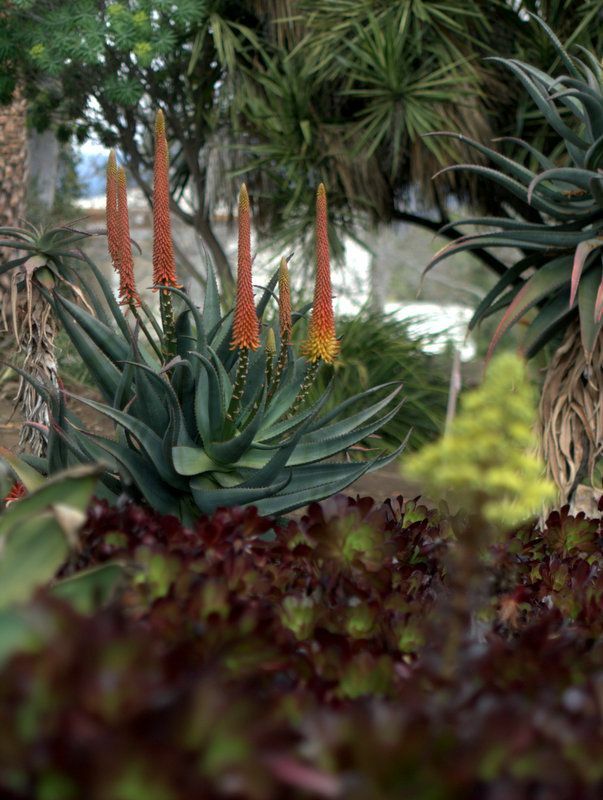 I’d been meaning to catch the aloes in bloom since the beginning of January, but one thing after another…and just 30 miles away too. Resolute this time, I cleared work over the weekend to leave Monday afternoon open. Los Angeles County had just shy of an inch of glorious rain Sunday, and there were rumors of rain for the foothills for Monday too. The relentless drought has turned me into a storm chaser, so even a slim prospect of rain was almost unbearably exciting. The foothills are notoriously volatile, weather-wise. 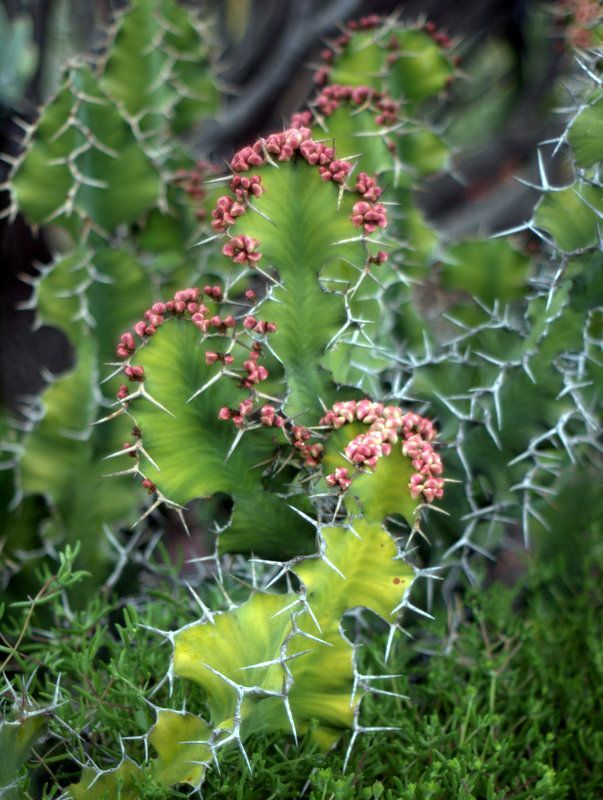 By 2:30 I was thoroughly drenched, running for cover among towering euphorbia and cacti in the desert garden. 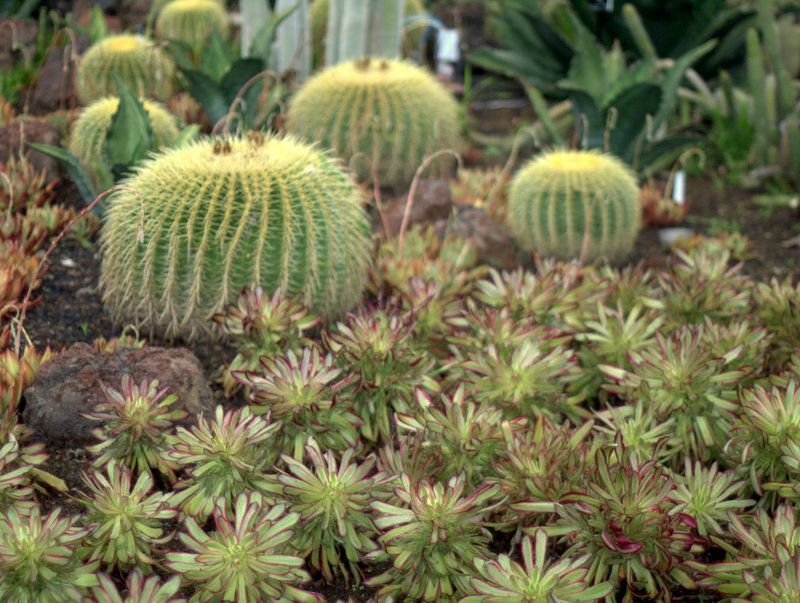 The nearest available cover, the desert conservatory, is closed on Mondays. I’d have to leave the desert garden to stay dry, so I opted for getting wet. As the rain increased from a drizzle to a downpour, which is just about when the shutter froze on my camera, I tucked the camera in my bag and called it quits on photos. 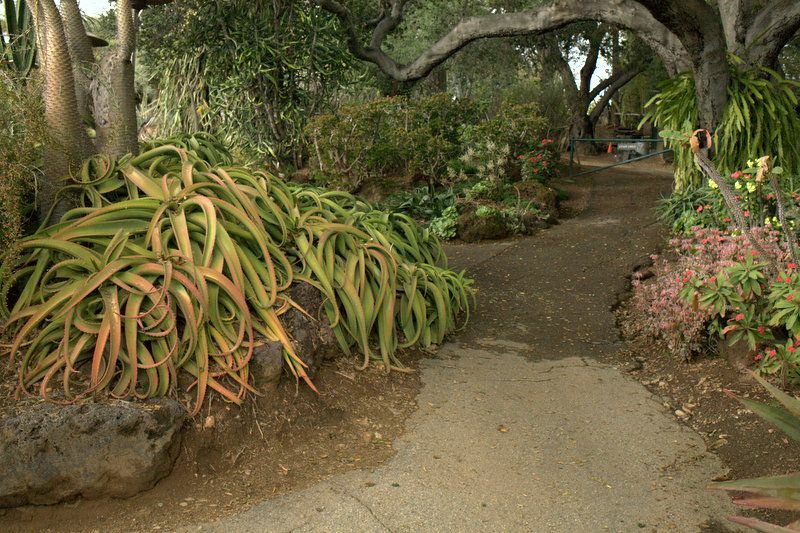 Like a nest of writhing snakes, Aloe vanbalenii, on the left. Muscular limbs of an oak in the background and the off-limits gate to propagation houses. Wandering the paths, with my sopping shirt sticking to my back, I remembered the umbrella in the car. Monday’s hours are 12 to 4:30, which barely left enough time to race back to the car to fetch the umbrella. I decided to go for it. The Huntington is undergoing massive alterations to the front entrance. As a result of the construction, entering now dumps you in the camellia garden. Which is quite a hike from the desert garden. At opposite ends of the Huntington in fact. Exiting is via the camellia garden as well. The rerouting due to construction turned a 5-minute walk into at least 15 minutes, walking briskly. At long last, reaching the parking lot, I noticed my Huntington sticker had slid off my purse in the rain. And I had thrown the receipt away…(idiot!) Rather than plead my pathetic case with a ticket clerk, I opted to leave at 3 p.m. At least I’d miss most of the commuter traffic. I was hoping to check on the Australian section. Another time. 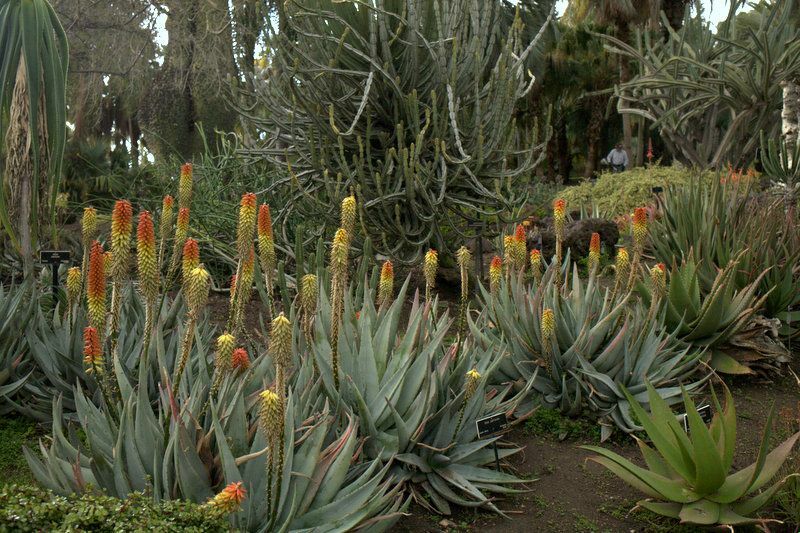 But I did get to see see some fine aloes, in and out of bloom. 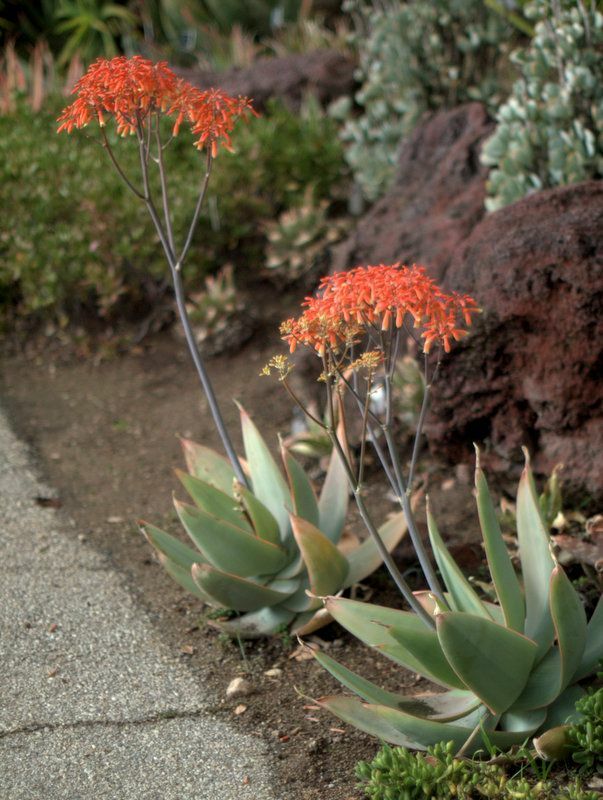 An open hybrid aloe. 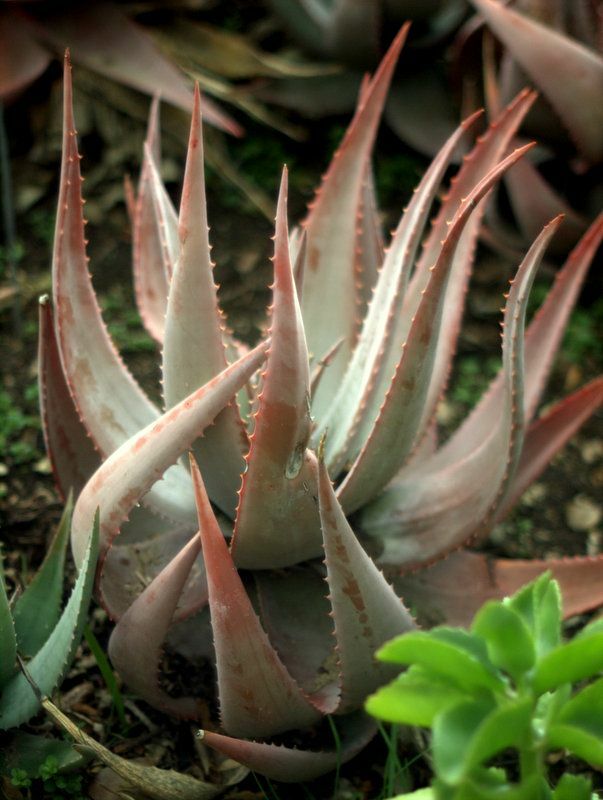 At the next sale, if there’s any aloe labeled “open hybrid,” I’m grabbing it. You never know, it could be this one. 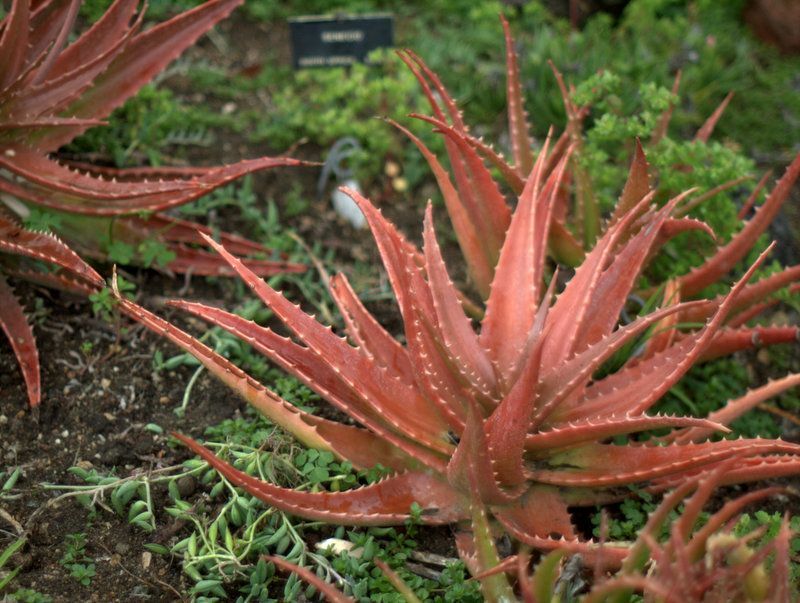 Aloe erinacea, which looks an awful lot like melanacantha, but erinacea is what the tag said. 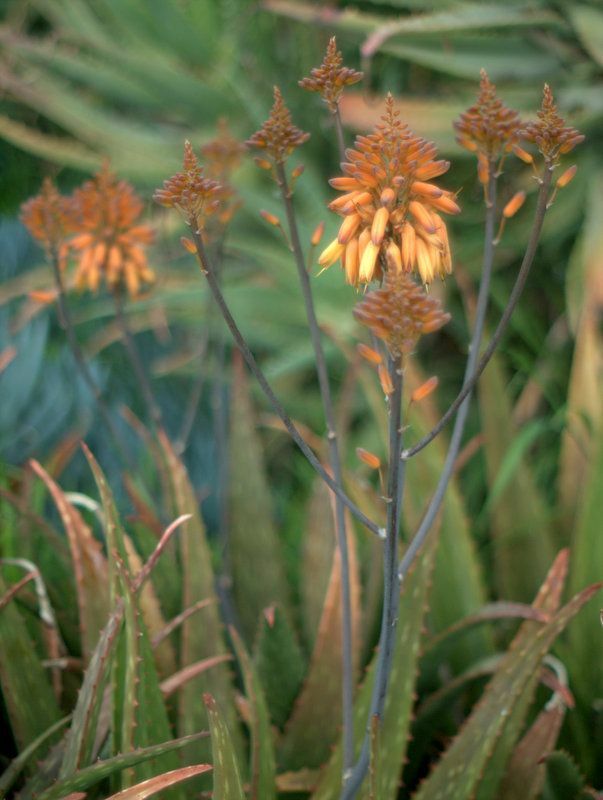 Aloe ‘Sophie.’ I’ll keep a lookout for ‘Sophie’ at the plant sales too. Aloe ‘Kujo.’ Nice to see this one in bloom. I found ‘Kujo’ at a local nursery earlier this winter. 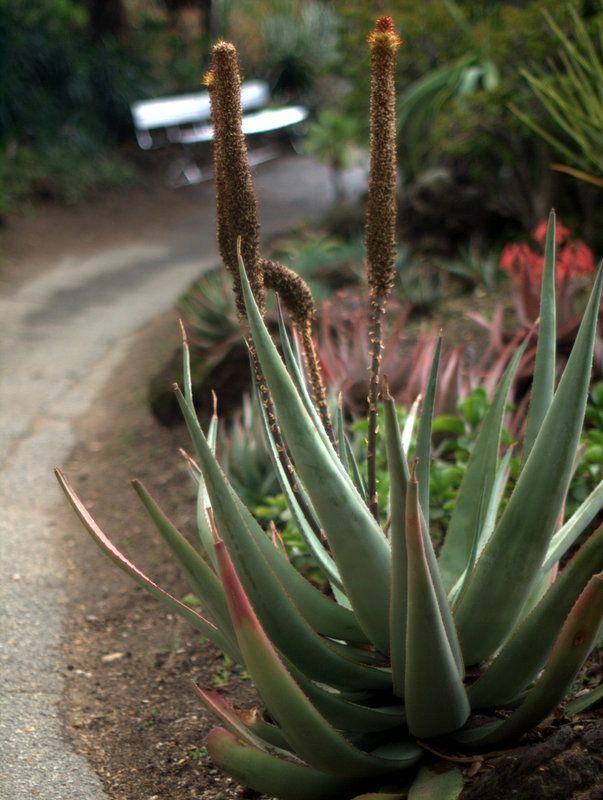 ‘Hercules.’ The genus aloe was too small to contain him. 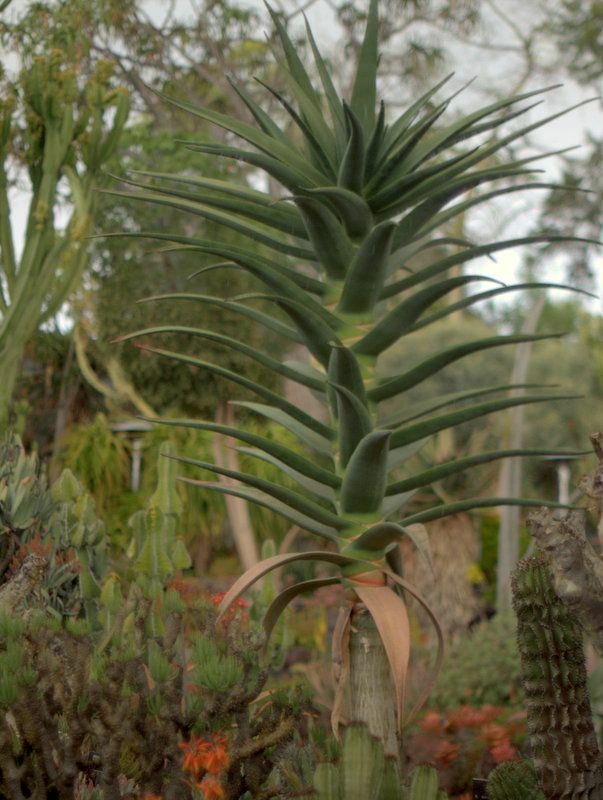 Like the other tree aloes, he’s busted out and moved to aloidendron. 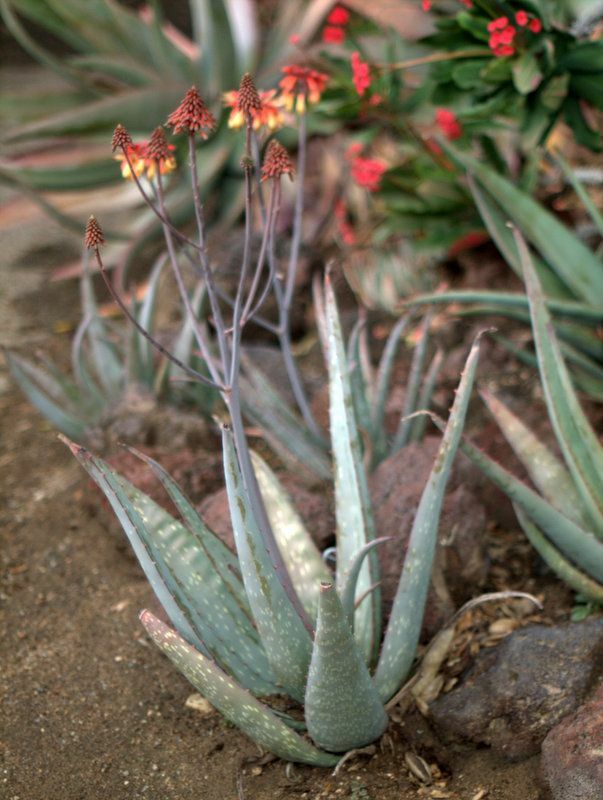 Aloe striata. Mine’s in too much shade currently. 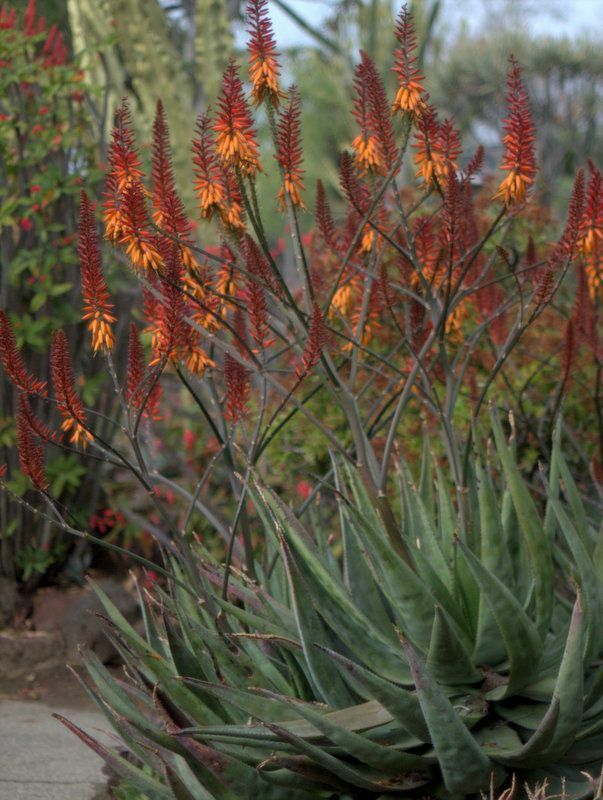 Can’t seem to find the right spot for this fairly common aloe. Three moves and counting. 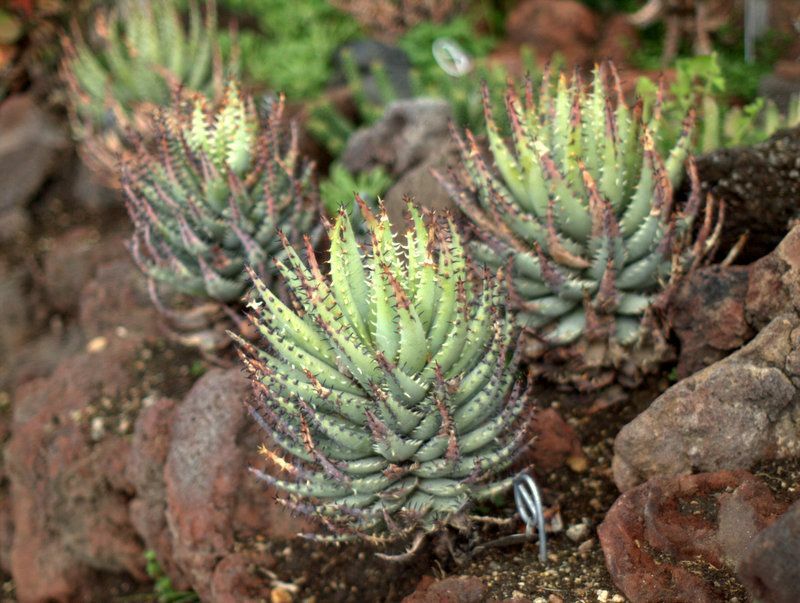 Agave vilmoriana with echium rosettes unfurling for spring. I swear I’ll be back to see them in bloom. Heading home, the roads were dry. Long Beach was dry. Seemed like the only rain Monday was at the desert garden. 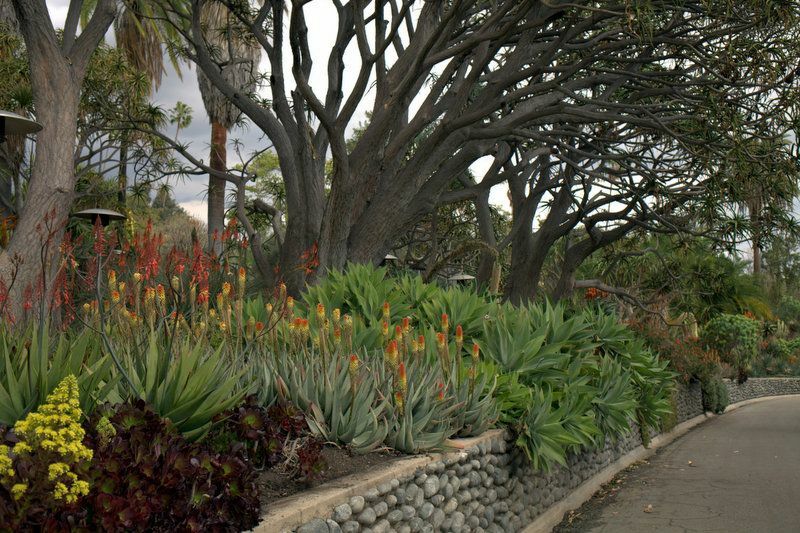 This entry was posted in agaves, woody lilies, garden visit, succulents and tagged Agave attenuata 'Boutin's Blue', Agave vilmoriana, Aloe 'Goldilocks', Aloe 'Kujo', Aloe 'Sophie', Aloe bussei, Aloe castanea, Aloe chaubadii, Aloe dorothea, Aloe erinacea, Aloe percrassa, Aloe sinkatana, Aloe striata, Aloe vanbalenii, Aloidendron 'Hercules', Huntington Botanic Garden Desert Garden. Bookmark the permalink. I’m so glad you went. Your photos have such a moody quality because of the storm light. I wish I could have been there at the same time. 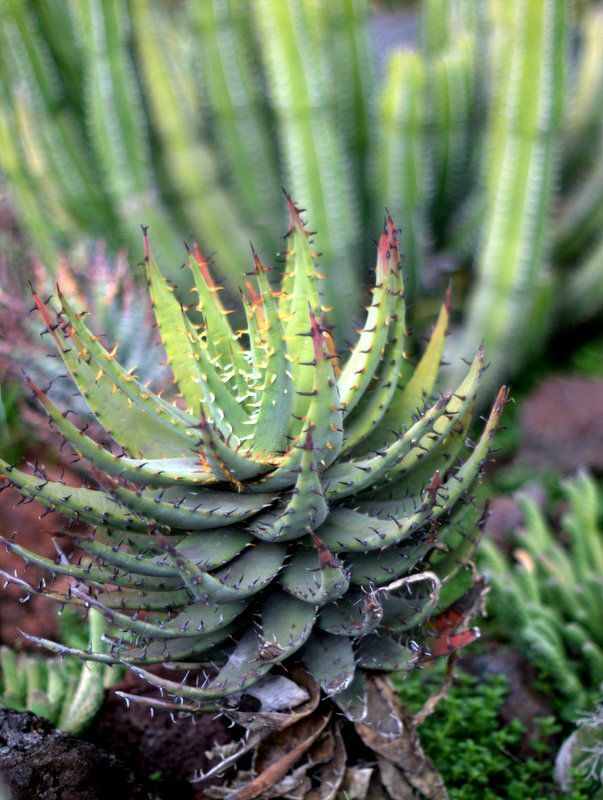 Aloe erinacae is closely related to A. melanacantha but noticeably smaller (and much more rare). Personally, I think A. melanacantha is just as attractive and a lot cheaper. 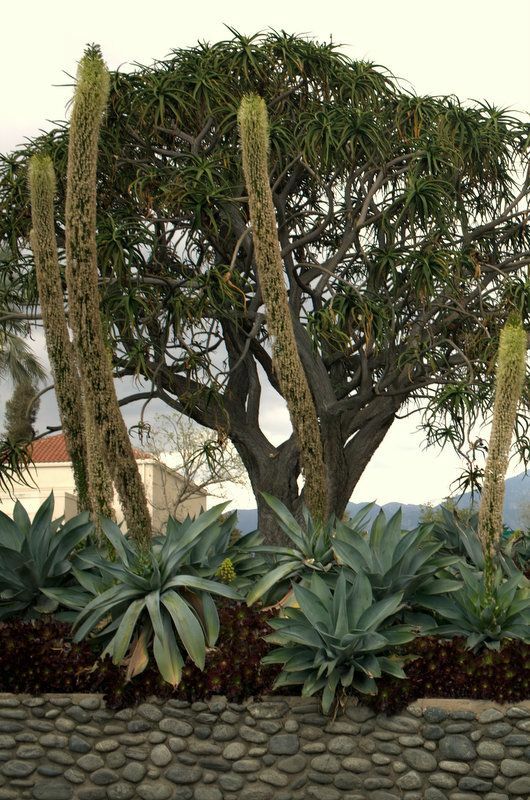 The Agave attenuata toward the top is indeed ‘Boutin Blue’. I spotted a label when I was there in December. I thought the new entrance was suppoosed to be finished by mid-January? I guess not. You earned those photos, Denise! You did well despite the snafus. I agree with Gerhard that the gray, stormy sky adds a wonderful ambience to your photos. I wouldn’t have expected it to be that wet still yesterday afternoon, either – we got a little less than 1/2 inch of rain here. 30 miles can take a couple hours in crappy traffic, so you get a pass on your visiting schedule ! When I took the photo workshop in Yosemite in fall of 2013, our instructor emphasized the rule that bad weather makes great photos..these photos are proof-you took one for the team. 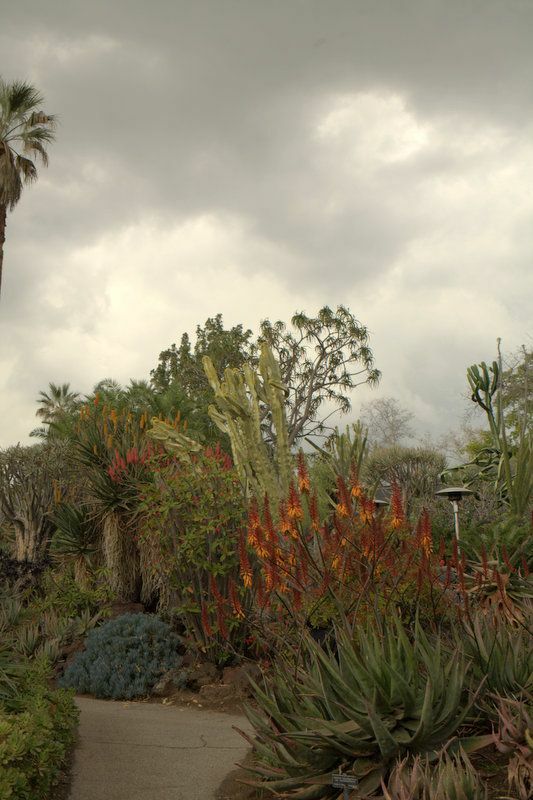 Oh, I loved seeing all these Aloes in bloom, you got some great shots, especially like Gerhard said above, the moody ones with the stormy sky. Sorry you got drenched and didn’t get to see all you planned to, but it was worth it. Thanks! I can almost see you in the rain, smiling. Glad you got some wonderful photos and didn’t lose a camera in the process. @Gerhard, I don’t have either at the moment, but I’d be happy with melanacantha. Annie’s carries it off and on. This link details the construction’s progress: http://www.huntington.org/projectsinprogress/. @Kris, it was a beautiful storm! Hope you got some of that rain on Sunday. @Kathy, I always use the Express Lane when taking the Harbor Fwy now. Well worth the $! Yeah, it was nice not to have full sun at 2 p.m. for photos for once. @Alison, it wasn’t exactly a cold rain. The biggest problem was the camera. I did that at the Fling too, kept shooting photos in the rain. We were going to go on Sunday but I was utterly wiped out from mulching all day Friday and Saturday. The DG looks muy fabuloso under cloudy skies via your camera. Next time, the umbrella, ok? 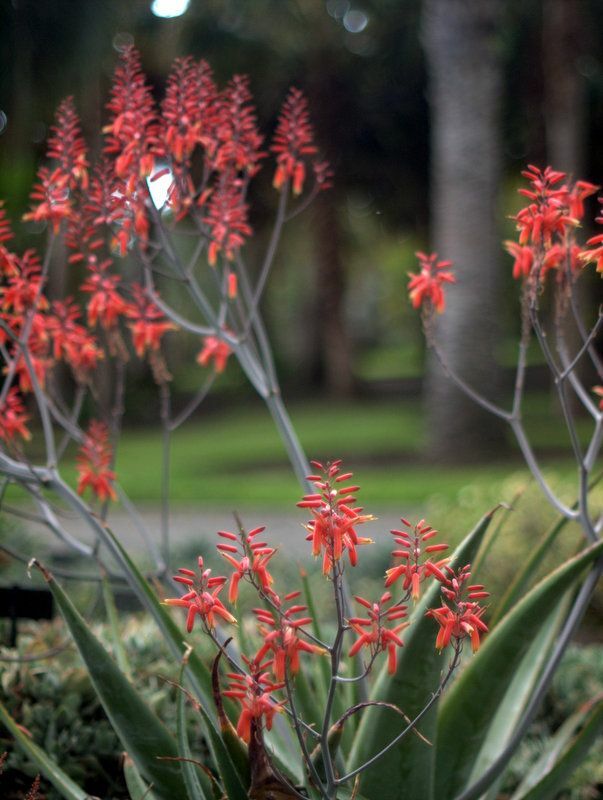 Forgive me if I have mentioned this before, but I love Aloe blooms. The only place I ever get to see them is in a hothouse somewhere. 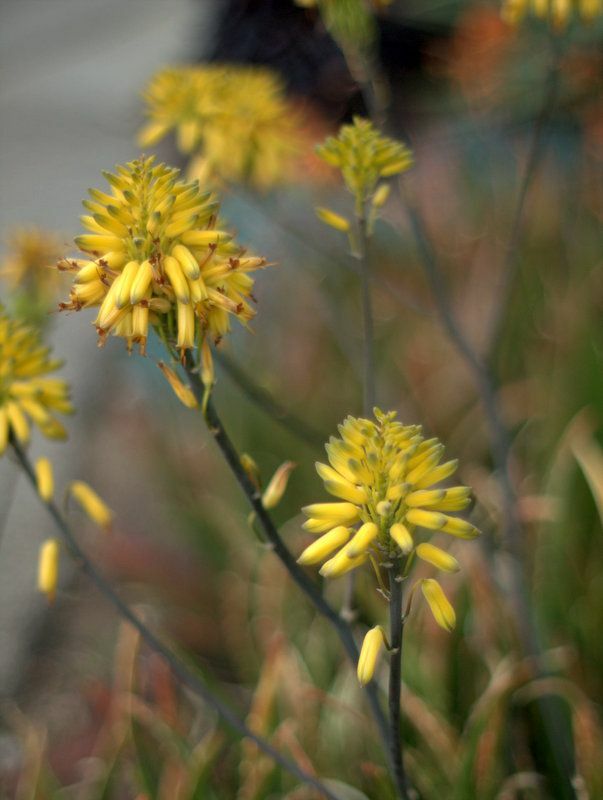 We do have one, maybe two species that can take our cold, but they lack the flower power of a mass blooming at the Huntington. 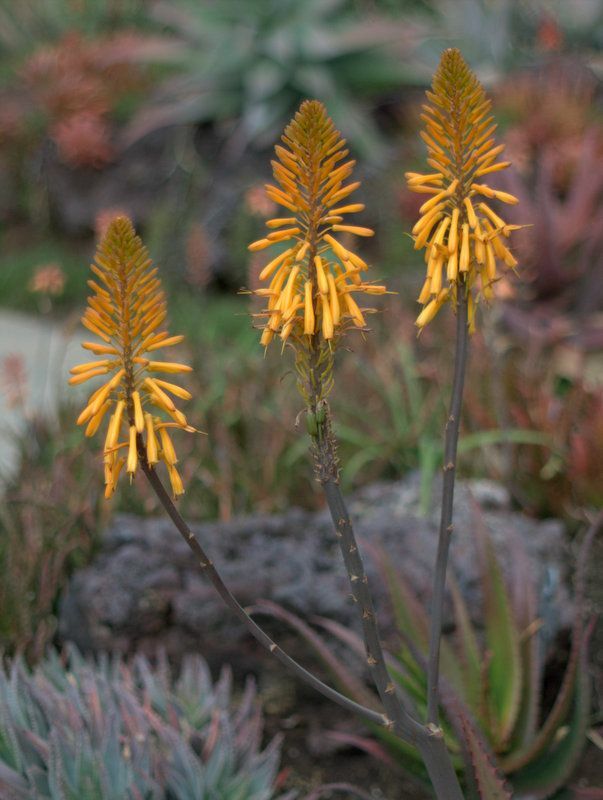 So we must content ourselves with Kniphofia. This area has its own Huntington connection. The big shipyard here in Newport News was run by Henry Huntington after the death of his uncle. It is the only place in the country where aircraft carriers are built, and it is one of the largest employers in the state. Wanna trade? 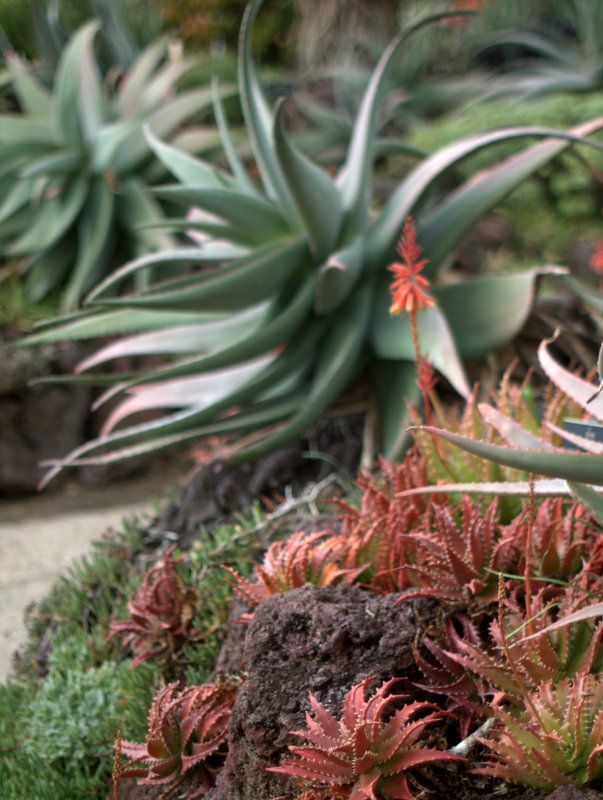 They’re all appealing (particularly knocked out by Aloe percrassa), but I keep coming back to the spiky plant erupting in tiny pink blooms along its spiny edges. What is *that*??! This Eastern forest denizen pines for a few pics of the camellias, which must also be putting on a real show now, but I know better than to expect any here. 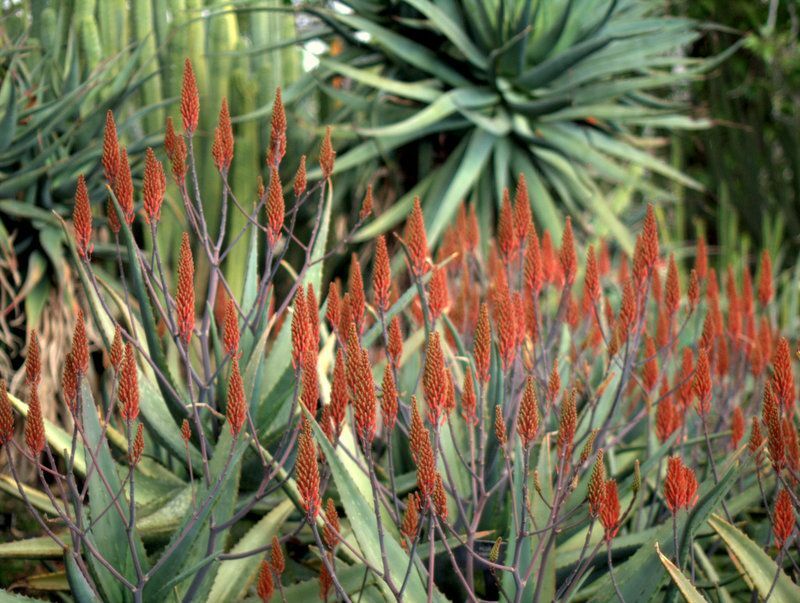 And they’re not quite as riveting as the aloes etc. — in theory, I could even grow some. [In practice, there’s nowhere on our two acres that is both sheltered from winter winds and shaded from early morning sun. 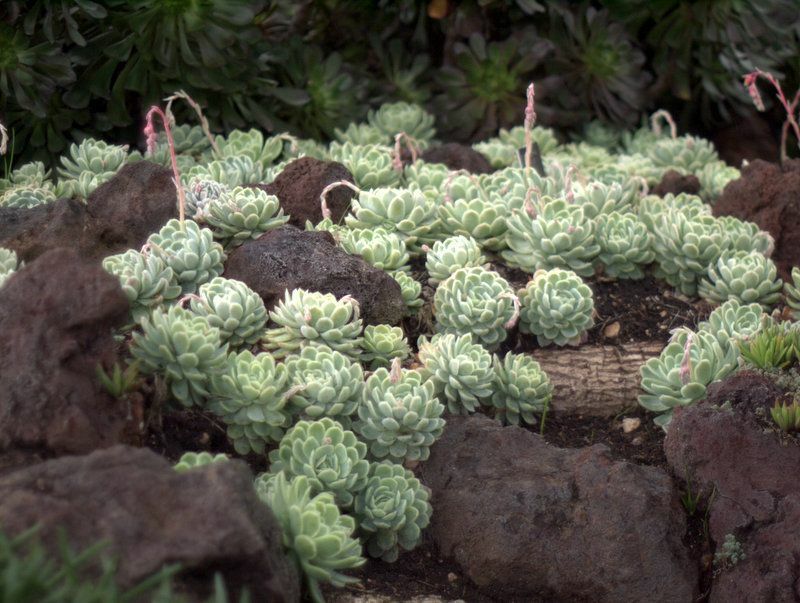 I am so distracted in the Huntington cacti garden – something wonderful always seems to be happening and before I know it I have spent most of my time there. You have captured the wonderful light of the storm – everything seems glowing and waiting for the rain. 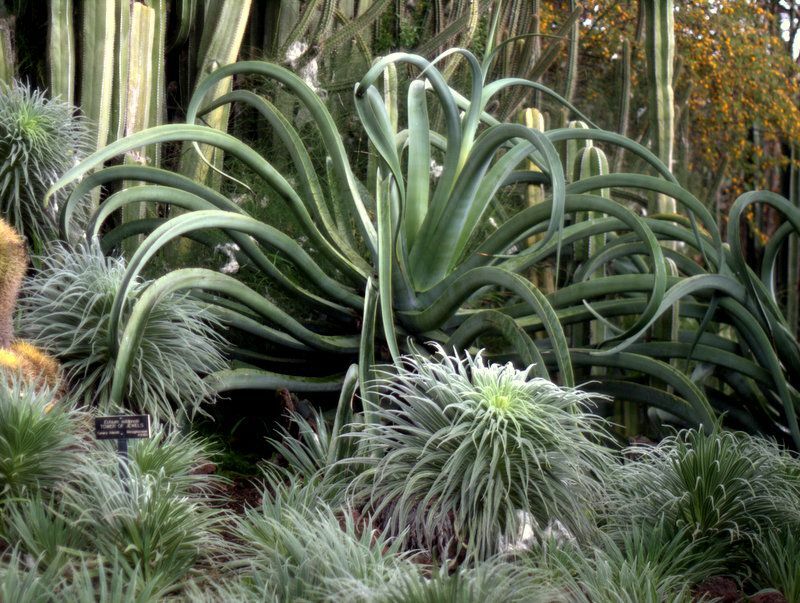 Oh I wonder how the Octopus Agaves there get so curly -ha – mine do not look like those! I enjoy visiting gardens in the rain. You get the place to yourself, and the light is usually pretty cool, unless it’s just pouring, and then you have the satisfaction of seeing rain! I hope your garden got some of the precious wet stuff too. Great photos, like an undersea world. @Hoov, they’re saying rain this weekend. Go! @Les, those Huntingtons cast a long shadow, don’t they? 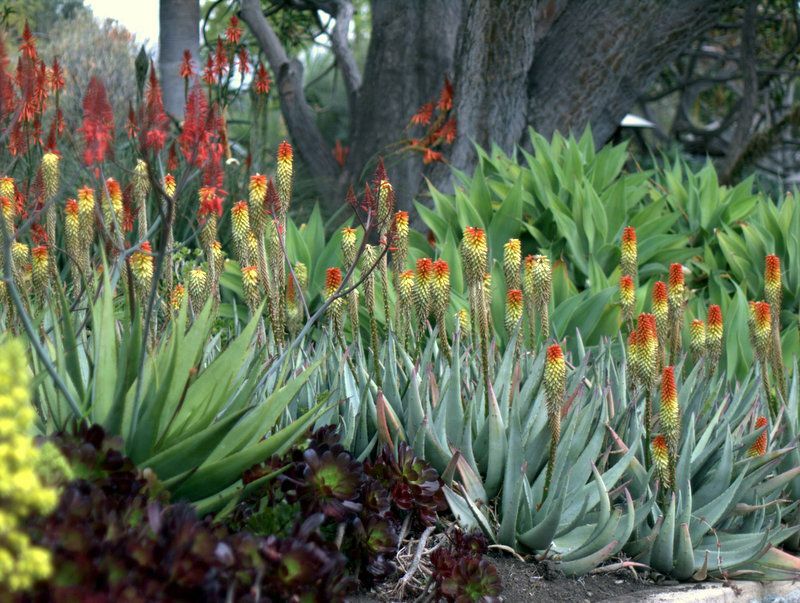 And I’ll say it again too: I love aloes! @Nell, I didn’t see a label but am pretty sure it’s Euphorbia grandicornis. sorry about no camellia photos! Apart from no inclination, there was no time! @Pam, coming from Austin I know you share an appreciation for rainstorms.